This gold burger will cost you about Rs 4185.71. OMG! Would you like to spend Rs 4185.71 for a 24-karat gold burger? Yes, this astonishing burger will make its debut at Dubai Festival which will take place from February 23 to 25. This king sized burger is called Burg Khalifa, a five-storey Wagyu beef creation layered with foie gras, truffle cheese and sandwiched between a brioche bun. 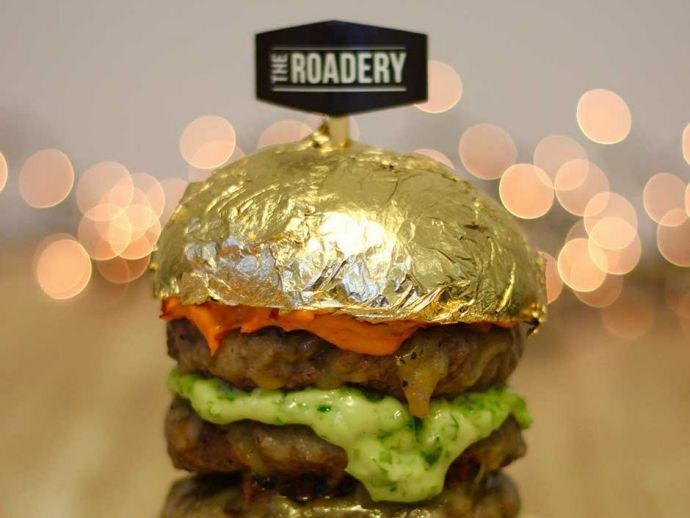 And you will be amazed to know that the bun is in 24-carat gold leaf, and costs Dhs 230. This oversized, out of the box Burger will take its place in the international food truck event at Burj Park in Downtown Dubai. The maker of Burg Khalifa has also arranged a competition in which the two luckiest customers will get the chance to win the Burg Khalifa. Dubai Food Festival 2017 will welcome more than 25 food trucks from the USA, UK, Singapore and the UAE. Eat the World DXB is also a part of Dubai Food Festival. Sumaiya believes in expressing her thoughts with the sword of words. This management lover handled 30 and 100 volunteers for All India Interschool Personality Contest in 2013 & 2016 respectively, by Oxford Speakers’ Academy. A chatterbox, she also hosted three shows at All India Radio. This compotator represented KKSU in the inter-university debate competition - Indradhanushya.